Starring: Benedict Cumberbatch, Chiwetel Ejiofor, Rachel McAdams, Benedict Wong, Tilda Swinton, Mads Mikkelsen. With the runaway successes of Guardians of the Galaxy and Ant-Man, Marvel Studios have proved adept at bringing lesser and more obscure comic book properties to the big screen and in a manner that manages to please fans and regular audiences alike. Doctor Strange would immediately seem a far trickier and more daring gamble than those previous hits but for the most part, Marvel Studios succeed once more. Based on the Marvel comic books by Stan Lee and Steve Ditko, the journey of neurosurgeon Doctor Stephen Strange from arrogance to fall from grace and eventual redemption may be a little clichéd but via the film’s exploration of magical abilities and mystic realms there lies another dimension to the storytelling that opens up the possibilities for future Marvel Studios productions. It’s fair to say in that sense that this makes the “Sorcerer Supreme” an important character as the looming apex of Avengers: Infinity War approaches. In the role of Stephen Strange, Benedict Cumberbatch makes for a strong lead and although for some it may take a little time to adjust to his American accent, the Sherlock and Star Trek Into Darkness star laps up the material handed to him in a performance that’s impassioned, witty and by the end of it all, noble. Seemingly the requisite love interest, Rachel McAdams is somewhat underserved as Christine Palmer although she does share some vital scenes with Cumberbatch that helps the audience become more invested in the character and his arc throughout this origin story. Tilda Swinton is wise and otherworldly as the enigmatic Ancient One and co-stars Chiwetel Ejiofor and Benedict Wong fit nicely into the mix as fellow sorcerers Mordo and Wong respectively. As the main antagonist, Mads Mikkelsen’s Kaecilius – a former pupil seeking to unlock the secrets of dark magic – has some great moments, rising to the challenge of being pitted against the talents of Cumberbatch and Swinton but is ultimately less memorable than Hugo Weaving’s Red Skull (Captain America: The First Avenger) or James Spader’s Ultron (Avengers: Age of Ultron). There’s a slight over reliance on humour at times, parts of it are welcome relief but some moments feel forced, included merely for the sake of it and arguably undermine several key scenes that would have benefitted from a more dramatic tone. Where Doctor Strange really excels is via its jaw-dropping, kaleidoscopic visuals as director Scott Derrickson intertwines influences of Escher with the cinematic awe of Inception and the mesmerising psychedelia of 2001: A Space Odyssey that bring the trippy imaginings of Messrs. Lee and Ditko breathtakingly to life. The extra expense of an IMAX 3D ticket is fully warranted for the fullest possible immersion in the mind-bending spectacle of folding cityscapes and unravelling astral planes. Ultimately it’s the visual elements that gloss over the overall flaws in the tone and narrative of Doctor Strange but there’s no denying the charm of Benedict Cumberbatch’s performance and the potential of further adventures of Marvel’s Master of the Mystic Arts. The bottom line: Despite some formulaic elements and jarring moments of silliness, Doctor Strange is a reliably entertaining and visually stunning addition to the Marvel Cinematic Universe. Doctor Strange is screening in UK cinemas now and opens in the US and worldwide from 4th November. 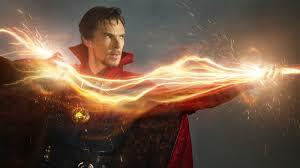 Benedict Cumberbatch confidently leads Marvel Studios’ ‘Doctor Strange’. With the future of the series secured by the transition from CBS to the CW, Supergirl makes an assured return with some small changes (including a new base of operations for the DEO) and one ‘Super’ addition (more on that in a moment). It’s more or less business as usual with Melissa Benoist the ever likeable lead in an episode that’s fun and action packed (aided by some impressive visual effects) with plenty of fan pleasing references to comic book mythology. There’s still an element of emotional angst (mainly via Kara and James Olsen’s friendship/relationship dilemma) that’ll irk some viewers, but will certainly appeal to the young adult demographic. Of course, it’s the introduction of Tyler Hoechlin as Clark Kent/Superman that’s been most anticipated and proves to be the biggest highlight. Much like the series itself it’s an optimistic and nostalgic take on the character that melds Hoechlin’s enjoyable performance with dashes of Christopher Reeve – with a plethora of callbacks to Richard Donner’s Superman throughout to hammer home that point. It’s great that the producers have finally been allowed to fully include the Man of Steel, thus addressing the awkward elephant in the room that plagued last season and the solid chemistry between Benoist and Hoechlin makes their scenes together all the more pleasing, whether in their Kryptonian guises or not. Hopefully there’ll be plenty more opportunities for Hoechlin to return throughout the series. Inspired by the comic book storyline of the same name, “Flashpoint” opens with Barry living a happy, Flash-less life after the darkness and turmoil he experienced in season 2…achieved by him travelling back in time to prevent his mother’s murder at the hands of the Reverse-Flash. Time travel and alternate timelines is not something new to The Flash but in this one the super heroics are left to ‘Kid’ Flash Wally West (allowing Keiynan Lonsdale to step-up) whilst Barry treasures his new life in a world where both his parents are alive. Grant Gustin gets to play the brighter and breezier version of his character here and the new timeline also gives us some welcome twists on other main characters – most notably Cisco as an egotistical billionaire and Joe West a washed-up shadow of the heroic Detective and father figure we’re familiar with. Matt Letscher makes a creepy reprisal as the Reverse-Flash but unfortunately the central villain in “Flashpoint” is another, rather generic and uninspired riff on the ‘evil speedster’ in the form of ‘The Rival’ (Todd Lasance) who at least serves a purpose in bringing Barry back into action and facilitating a team up with Wally’s Flash. What’s sorely missing is the excellent Tom Cavanaugh and seen as he’s been rightfully bumped up to series regular it’ll be interesting to see what’s in store for one of the shows’ greatest assets. Events taking a dramatic turn, we learn – not unpredictably – that meddling with the timeline has consequences and with Barry’s memories of his previous reality gradually dissipating, this sets the stage for things to come. Despite this all being done before in The Flash there’s plenty of potential in loosely adapting the Flashpoint storyline and doing so could provide some nifty tweaks to keep the series fresh and enjoyable. After focusing on metahuman antics and dark mysticism last season, with Damien Darhk defeated and Oliver in place as Mayor of Star City Arrow steps back towards the hardened vigilantism of its earlier days. Those meta aspects broadened the overall scope of the CW’s DC universe but Arrow is arguably its better self when dealing with bone crunching and corruption and there’s plenty of that in this season premiere. Stephen Amell slips confidently back into the role of Oliver Queen/Green Arrow and although his mission as the Emerald Archer has reverted to more brutal times, the death of Laurel (Katie Cassidy) and the disbanding of Team Arrow leaves a large shadow and the way “Legacy” addresses this is laudable, via moral debates between Oliver, Thea, Felicity and a grieving Quentin Lance, redeemed by Oliver’s intentions to use official powers to root out police corruption and assemble a special anti-crime unit. After a number of guest appearances last season, it’s good to see Echo Kellum become part of the regular cast, although it remains to be seen whether the interplay between Felicity and Curtis will be as fun as it was last year or just become plain annoying. The martial arts action is as slick and exciting as ever (but paling in comparison to the visceral thrills offered by Marvel’s Daredevil) and “Legacy” features some crazy sequences, one of which involves Oliver dangling from a fleeing helicopter. We’re left with the emerging threat of another Dark Archer-esque villain who will hopefully turn out to be more compelling than The Rival over in The Flash and stand shoulder to shoulder with the likes of Ra’s Al Ghul and Damien Darhk. 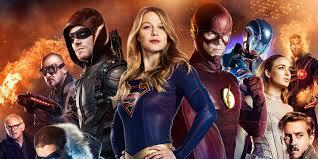 Supergirl, The Flash and Arrow air in the UK Monday, Tuesday and Wednesday evenings (respectively) on Sky 1. US viewers can catch them on the CW. DC’s Legends of Tomorrow returns to UK screens on Thursday 3rd November, Sky 1. What did you think of the season premieres of Supergirl, The Flash and Arrow? Following the conclusion of the globe-hopping International Iron Man and in the (impending) wake of Civil War II Brian Michael Bendis reteams with artist Alex Maleev to bring readers Infamous Iron Man, where the reformed Victor Von Doom decides that nature abhors a vacuum and that the world still needs an Iron Man. Part of the Marvel Now! refresh, Infamous Iron Man continues to follow Von Doom’s path from villain to ‘hero’ set forth by the conclusion of Secret Wars (which left him with a face devoid of that grotesque scarring) and explored initially in Bendis’ first volume of Invincible Iron Man. Von Doom has always been one of Marvel’s greatest villains and we’ve already seen that there’s plenty of potential for the former Doctor Doom to become an equally compelling hero. 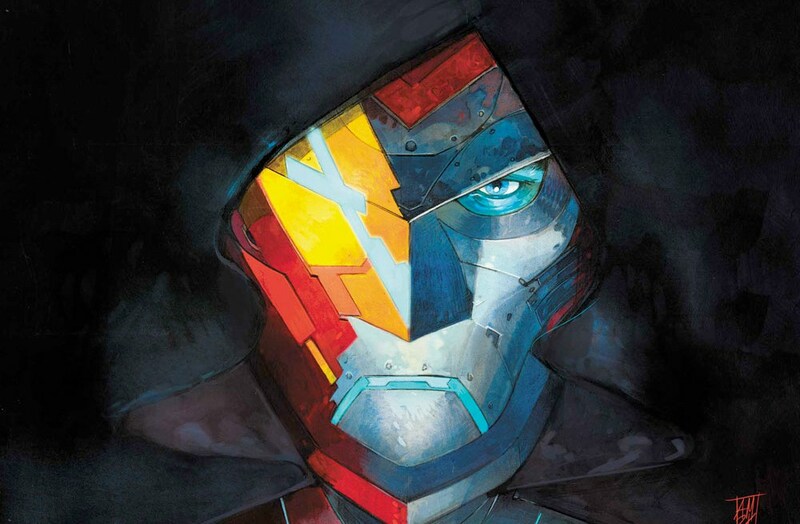 Infamous Iron Man gets things off to a slow, yet interesting start – much as was the case with International Iron Man – and if you’re prepared to forgive the larger focus on exposition there’s much to enjoy here. It seems that Bendis is merely setting the scene with Von Doom’s motivations kept relatively vague. Bendis has helped to delicately redefine Von Doom over the last year and it’s an interesting evolution for the character, there’s still a streak of darkness and a restrained hint of ego but there’s an iron will that makes him an appealing successor to Stark. Touching on the tragedy of Doom’s past (and facilitating the emotional crux of this opening chapter), Bendis manages to delve into the mind of the character whilst maintaining some of the enigma. It’s certainly going to be interesting to see the layers peel away as the new Iron Man rises. The art by Alex Maleev is nothing short of superb and neatly fits the tone of the book with dark, scratchy and moody visuals complemented perfectly by Matt Hollingsworth’s muted colour palette. Fans of Maleev’s work on International Iron Man and Daredevil will not be disappointed. Minor pacing issues aside, the only real drawback is not down to Infamous Iron Man itself but with the delays to the remaining issues of Civil War II. There are significant hints as to the fate of Tony Stark but it remains to be seen if the lack of conclusion to that story will creatively hinder this title’s opening arc. Still, there’s enough mystery and intrigue that will keep Iron Man – and Von Doom – fans reading. The bottom line: Despite it’s slow pace, Brian Michael Bendis infuses Infamous Iron Man with plenty of intrigue that together with great art provides enough reason to keep reading. Infamous Iron Man #1 is published by Marvel Comics and is available in print and digital formats now. Alex Maleev provides sublime visuals for Marvel Comics’ ‘Infamous Iron Man’. Spilling out of the pages of The Amazing Spider-Man, Dan Slott launches the next Spider-Man event which could prove both surprising and controversial as Peter Parker is set to face ghosts from the past. Further elaboration would result in spoilers, but needless to say there are certain elements to The Clone Conspiracy presented here that threaten to undo defining events from Spider-Man history, which will either be welcomed or derided in the months to come. Building on the “Before Dead No More” arc in Slott’s recent ASM issues, Dead No More: The Clone Conspiracy #1 opens at the funeral of Jay Jameson as Peter wrestles with the decisions he’s made and the ongoing mysteries tied to the New U corporation. Slott sets the scene with some emotionally charged exchanges between Peter and Anna Maria, yet it proves to be a slackly paced opening as the dialogue becomes weighed down by exposition designed to make this series accessible to new readers whilst also serving as a recap for existing ones. To an extent, it works however there’s a definite sense that those who haven’t been following this current volume of ASM and without some familiarity with previous events such as the Superior Spider-Man run and Spider-Verse (as well as overall Spider-Man history) will ultimately wind up a little lost and less invested in this particular saga than established fans. Luckily, once the set-up is out of the way and Peter continues his investigations of New U as Spider-Man, Slott’s narrative begins to gather pace and before long thrusts the reader into some wonderfully staged action, culminating in a confrontation with Dead No More’s central villain, the Jackal and a cliffhanger that will leave readers anxiously awaiting more. It’s in these moments that artist Jim Cheung shines with detailed, cinematic layouts that accentuate the excitement. Some wonky character facials during the early funeral scenes aside, Cheung’s art is a perfect fit for the title – especially if it proves to be pacier in subsequent instalments. The book closes with a back-up story from Slott with art by Ron Frenz that harkens back to a key, classic Spider-Man story that plays as a fitting tribute to that particular era of comics whilst adding layers to one of The Clone Conspiracy’s biggest twists. 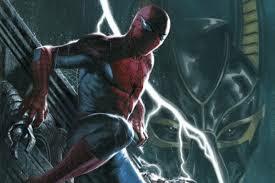 The bottom line: Dead No More: The Clone Conspiracy #1 is a decent, if slightly uneven start to Dan Slott’s latest Spider-Man saga that certainly shows signs of promise. Dead No More: The Clone Conspiracy #1 is published by Marvel Comics and is available in print and digital formats now. Cover art for Marvel’s ‘Dead No More: The Clone Conspiracy’ #1 by Gabriele Dell’Otto. Based on the cult classic 1973 film written and directed by Michael Crichton (mastermind author of noted SF works Jurassic Park and The Andromeda Strain), HBO’s television adaptation of Westworld has been developed for the smaller screen by Jonathan Nolan (Person of Interest) and Lisa Joy (Burn Notice) together with co-producer J.J. Abrams. The concept of Artificial Intelligence and how it relates to human nature is something that has been explored endlessly in science fiction and in various forms of media. HBO’s Westworld necessarily expands on what could only be touched upon in Crichton’s 88-minute film and like Ronald D. Moore’s reimagined Battlestar Galactica, what’s presented here is much more complex and cerebral. On a particular level it’s unnerving as the robot (or more precisely, android) ‘attractions’ of the Westworld theme park – known as ‘hosts’ – are becoming more realistic and virtually indistinguishable from genuine human beings as their creators strive for that perfection of realism and efficiency – something that is firmly entrenched in the zeitgeist of the technologically driven age we live in. Written and directed by Nolan, “The Original” assembles a strong cast which includes Evan Rachel Wood, James Marsden, Thandie Newton, Jeffrey Wright and most impressively Anthony Hopkins and Ed Harris. Much of the episode’s focus centres on Wood’s Dolores and it’s via her ‘character’ and newcomer Teddy (Marsden) that we learn of the Groundhog Day like existence of Westworld’s A.I. lifeforms as they are programmed to reset and repeat the same patterns day after day, with little variation, to service the stories implemented by the park’s engineers. It seems here that Wood is being positioned as the series’ main protagonist and the True Blood actress proves effective in being naturally emotive, switching her performance as she becomes subtly more machine like when events lead to questions of the hosts’ existence and ultimate purpose. Yet it’s the critically lauded and awards worthy Hopkins and Harris that provide the biggest draw. As Westworld’s founder, Dr. Robert Ford, Hopkins conveys the intellectual qualities and complexities of the character with absolute aplomb as we meet a man at the leading edge of technology, constantly pushing the boundaries of perfection to deliver a more efficient and more capable ‘product’. Ed Harris (sharing some truly chilling scenes with Wood and Marsden) is equally compelling as the mysterious ‘Man in Black’, providing a presence that’s as foreboding as it is unsettling. The visual scope of Westworld is astounding, the grand, sweeping outback landscapes beautifully captured and arguably rivals the cinematography of some of cinema’s most beloved Westerns. As a director, it’s to Nolan’s credit that he is skilful in presenting the more intimate character moments, especially in the cold, sterile lab settings where the hosts are examined and ‘questioned’ about their abnormal behaviour. It’s here that Nolan utilises, to great effect, numerous close-ups that capture every nuance of the actors’ facial expressions. Nolan’s script is packed with quality dialogue that delivers intrigue, character drama and thought provoking, existential SF ideas which combined with those sumptuous visuals and a stellar cast demonstrates strong potential for the series ahead. HBO have been looking for their next big hit to follow Game of Thrones and Westworld could certainly be it. 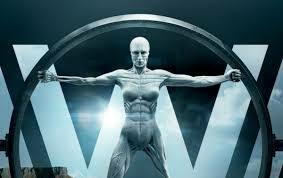 You can read the GBUK review of Michael Crichton’s Westworld here. The bottom line: Westworld opens promisingly as a superb cast helps introduce a world filled with thought provoking ideas and great dramatic potential. Westworld airs in the UK Tuesday at 9pm on Sky Atlantic. U.S. viewers can catch it 9pm Sunday on HBO. HBO’s ‘Westworld’ looks set to add new layers to the well-worn subject of artificial intelligence. Marvel TV brings a nifty, gritty urban vibe to Netflix with Luke Cage, the latest in their run of adult orientated street-level comic book shows, following the success of Daredevil and Jessica Jones. Judging by this first episode, Marvel/Netflix have afforded the same care and attention to Luke Cage as they did with those previous series with another strong and deftly executed production that once again boasts some great casting. 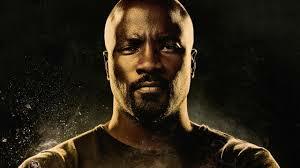 Mike Colter’s Luke Cage already made his mark on the MCU as an integral part of Jessica Jones and certainly demonstrated promise for a series of his own. Following what transpired in Hell’s Kitchen, Luke Cage opens with Marvel’s indestructible ‘Power Man’ (and eventual hero for hire) maintaining a low-profile in Harlem, working two jobs as he struggles to live day-to-day and keeping himself uncommitted to tackling the city’s growing crime problem. It’s not necessarily essential to have seen Jessica Jones but it certainly helps in understanding where Cage has come from and how events have led him to this low-point, as he continues to be haunted by a past that left him with unwanted abilities. Mahershala Ali (House of Cards) is appropriately menacing and dislikeable as ‘Cottonmouth’, club-owner and crime boss who beneath a demeanour of grandeur there seethes a fearsome rage of Wilson Fisk proportions. His influence is enforced by his cousin, corrupt Councilwoman Mariah Dillard – played by Alfre Woodard (completely unconnected to her role in Captain America: Civil War) whose gravitas provides this series’ element of star power. As Cottonmouth connects with former convict ‘Shades’ (Theo Rossi) we’re also introduced to Simone Missick’s Misty Knight, a potential ally for Cage and who may be more than she first appears. Written by showrunner Cheo Coker (Ray Donovan), “Moment of Truth“ favours a slow-burn approach in setting the scene and establishing the key players and status quo but by the closing credits there’s a sense of threats brewing and a storyline building (with promising hints that we’ll get to explore that back story alluded to in Jessica Jones), leaving no doubt that Cage won’t remain on the side-lines for much longer. The bottom line: Marvel/Netlix deliver a promising and enjoyable start to Luke Cage that on first impressions looks to evoke the same quality as their previous efforts. All 13 episodes of Luke Cage season 1 are available to stream now via Netflix. Bulletproof and ready for action: Mike Colter is Luke Cage in the latest Marvel/Netlix venture.